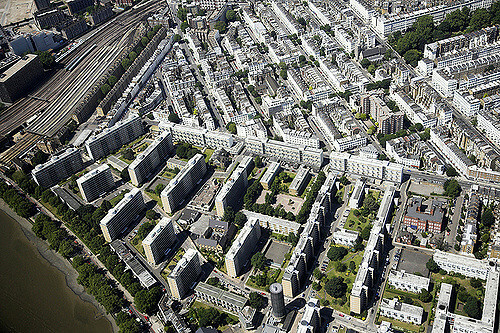 Built alongside the Thames, Churchill Gardens the largest local authority estate in Westminster, with 1600 dwellings. (1770 including Russell House) These are a mix of flats of all sizes and a few houses. It was designed after the war by award-winning architects Powell and Moya and is regarded as one of the finest examples of social housing. There is a thriving Residents’ Association, a residents’ hall, a youth club hall, two sports pitches, three playgrounds and an abundance of open space. The estate is managed by CityWest Homes on behalf of Westminster City Council. There are two primary schools on the estate, St Gabriel’s Church of England Primary and Churchill Gardens Primary Academy. The Pimlico District Heating Undertaking provides energy to over 3,200 homes, three schools and 50 commercial premises. It was the UK’s first combined heat and power operation, originally using waste heat from Battersea Power Station. The Churchill Gardens Residents’ Association represents the interests of all residents in Churchill Gardens. It is funded by the fund raising activities of the Residents’ Association. YOUR RESIDENTS’ ASSOCIATION NEEDS YOU!!! And it is free! Let your voice be heard. It is important that all as many as possible join the Residents’ Association so we can represent everyone’s interests and make this an even better place to live. So join up today, even if you are only here for a short time. The Residents’ Association publishes The Gardens Gazette, which comes out quarterly.